According to the American Association of Dermatology, hereditary hair loss affects approximately 80 million men and women in the U.S. In light of August being National Hair Loss Awareness Month, Ark Sardarov, founder of DesignX Hair Creations, which specializes in hair loss solutions for men and women, is hitting the airwaves to educate those suffering from hair loss on measures to take to rectify the issue. The various topics one may hear KABC 790 include putting off doing something about hair loss, taking care of the problem immediately and the social stigma for women concerning hair loss. DesignX was founded by Ark Sardarov, a former corporate banker, and Ruth Ramirez, a licensed cosmetologist. As a DesignX client himself, Ark is empathetic and compassionate to his clients, with whom he sets out to build long-term relationships. 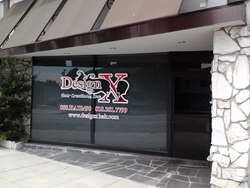 Together, the DesignX team has abundant experience in hair loss, of both men and women, providing hair loss solutions, hair products and salon services. For more information or a consultation, please call (818) 351-7799, or visit the salon at 1011 W. Olive Ave., suite B, Burbank, CA 91506.